Instacasino is one of the newest online casinos out there, as they only went live late in 2015. In an industry packed to the brim with different operators, it is extremely difficult to find a way to the top. It takes determination, versatility and a deep understanding of the casino universe. Apparently, Instacasino knew exactly what they wanted to do when they opened their doors. In a very short time, this casino has managed to attract literally thousands of players from all over the world, even though their main focus is on Scandinavia, Germany and English-speaking countries. When Instacasino started accepting players, they separated themselves from the enormous crowd by offering very good bonuses to new players. This continues to this day, and they certainly do their best to make players stay. Once you open a new account, which by the way is very fast and easy, you will get a lucrative welcome package. This one comes with your first three deposits, and gives you a bunch of RealSpins as well. RealSpins is a creative, new way to give away free spins to players. This is an Instacasino exclusive bonus. RealSpins have no conditions, meaning they are solely yours to enjoy. Then you have three deposit bonuses to look forward to. One gives you a 100 % bonus up to 100 euro, the next one a 50 % bonus up to 200 euro, and the third one another 50 % bonus up to 200 euro. Meaning you can get 500 euro in total, in addition to 50 RealSpins on the new, popular slot machine Fire Joker. Go and get the cash! User-friendliness is definitely in focus at Instacasino. The top menu basically gives you an overview of everything that is available at this lovely online casino. You can easily choose between the top 10 most popular slot machines, video slots, classic slots, table games, jackpot games, video poker and live casino. Most of the slots are made by NetEnt and Microgaming, the two biggest slot providers in the industry. Meaning you have endless hours of action-packed, fast-paced slot excitement to look forward to. First of all we need to point out how great the whole site is made. It is simple, and yet not primitive. It is fast, and yet very smart and tidy. All games are organized into different categories, making it easy to find your way through the humongous selection of slots. You can easily choose which software provider you wish to try, and the big list of games is readily available in the middle of the screen. Popular games and slots with a progressive jackpot are easily distinguished from others by small logos in the corner of their respective pictures, and games with jackpots actually show the jackpot size at any given time. Impeccable design by Instacasino, we hope that other, bigger online casinos learn from these new fellows. 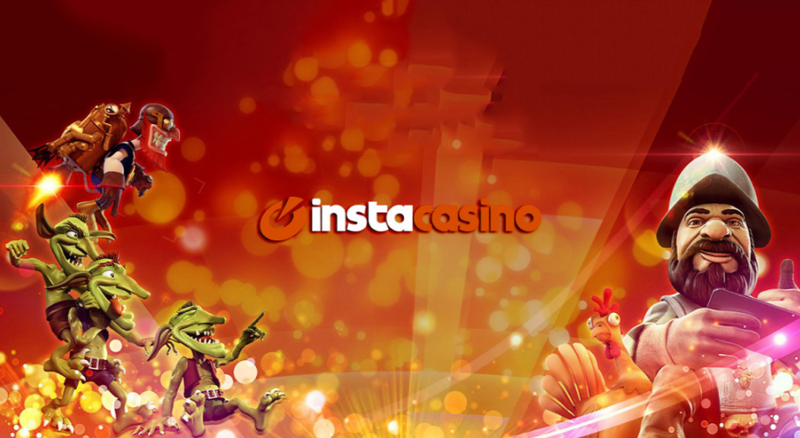 As all modern casinos, Instacasino is offering players a wide variety of payment methods. These include all bankcards (VISA/MasterCard), and online wallets like Skrill and Neteller. All deposits are processed immediately, meaning the money will show up on your account in the matter of seconds after you confirm all the details. As for withdrawals, Instacasino are making sure they all are processed within 24 hours. Since this is a fairly new casino, there are no delays. Fast, efficient customer service is available through live chat. If you are logged in, it should not take more than a few seconds to get a representative online. The professional and friendly service will definitely get you in a good mood.